Almost immediately after finishing the last round of copyedits on Show and Prove did I find something that conjured my biggest fears about writing a novel set in the 1980s. I discovered a blog post by a librarian expressing fatigue with the trend in young adult fiction about the 80s. She named a legitimate concern that haunted me throughout the writing of Show and Prove. Was setting the story in that decade integral to its telling or were the 80s just a hook driven by my personal nostalgia? It’d be dishonest to deny that nostalgia had a role in my writing this novel. Maybe Show and Prove didn’t have to be set in the 80s to tell the stories of Smiles, Nike, Cookie and Sara. But then I realized, so what? With the overwhelming majority of young adult fiction set in the 80s centering on white, middle-class and/or suburban experiences, the coming of age of Generation X warrants literary treatment. In fact, those of us who grew up in that decade Black and Brown, low-income or working-class, and/or urban especially in New York City, have stories that contain an imperative richness. Not only do they offer the universal experiences of adolescence that transcends race, class, and place, they also address the important socio-political questions made necessary by the specifics of race, class, and place that we should care about. In other words, your 80s were my 80s, my 80s were my 80s, but your 80s were not my 80s, and that is precisely why you need to engage my story as much as I need to tell it. When you belong to a community whose cultural productions are constantly devalued until deemed commodifiable, at which point they’re appropriated and your authorship erased, no attempt at historical fiction is gimmicky. It’s resistance. The Smiles and Saras that I grew up with in the South Bronx saw and loved The Breakfast Club and Say Anything. Those movies played in the ‘hood with no doubt that we would relate to them, for white characters to this day are held as the purveyors of universality. But before the solidification of hip-hop as a mainstream commodity, how many white kids got the chance to watch Krush Groove or Beat Street at their local theater? Not only did we participate in mainstream 80s pop culture, through our creation of hip-hop, we ultimately produced one of the decade’s most enduring phenomenon. Millions of youth across the globe have no concept of life without commercial hip-hop. Moreover, they keep it alive with no knowledge of the oppressive social conditions under which we created it over four decades ago. Because we experienced the same hopes and anxieties that mark adolescence, young people of any background can connect to a story such as Show and Prove. However, we also had more at stake. We grew up beneath the twin epidemics of HIV/AIDS and crack. Instead of gentrification, we had racist landlords who paid addicts to commit arson, burning our families out of their homes to collect the insurance. If our parents or caretakers were employed, they were likely civil servants having their unions threatened if not crushed. But if you grew up in the Bronx-is-burning Bronx, you remember something other than the drugs, the garbage, and the gangs. You remember all the colors, the rhythms, the aromas of that time, and some of them were quite beautiful. Innocence and innovation still lived here in underground trains, behind freshly tagged walls, and within the grooves of scratchy cassette tapes. Shootouts didn’t stop us from playing stoop ball. Amidst all this socio-economic abandonment and oppression, we exhibited tremendous creativity and resilience, and you and your kids should know all about it. In historical fiction for young adults, the decade should be relevant to the story, but when the characters are teens of color in New York City and the decade is the 80s, there is no such thing as irrelevant unless you don’t care about race or class. The street culture we created despite the social, economic, and political hand we were dealt has evolved into a multibillion dollar industry and, at its best, gives voice, comfort, and inspiration to kids and adults worldwide. Regardless of what you think of the current state of commercial hip-hop, its history deserves preservation in young adult literature since the youth of that time who invented it were not supposed to even survive. That one fact alone is all the relevance we need. Sofia Quintero has a BA in history-sociology and an MPA from Columbia University. She began her career as a policy analyst and advocate, working for various nonprofit organizations and government agencies, including the Vera Institute of Justice, Hispanic AIDS Forum, and the New York City Independent Budget Office. After years of working on diverse policy issues, however, she heeded her muse to pursue an entertainment career. She recently earned an MFA in writing and producing TV at the TV Writers Studio of Long Island University and contributed to the children’s anthology What You Wish For, the proceeds of which go to build libraries for Darfuri children in Chad. Her journalistic writings have been published in Urban Latino, New York Post, Ms., Cosmopolitan for Latinas and El Diario/La Prensa. 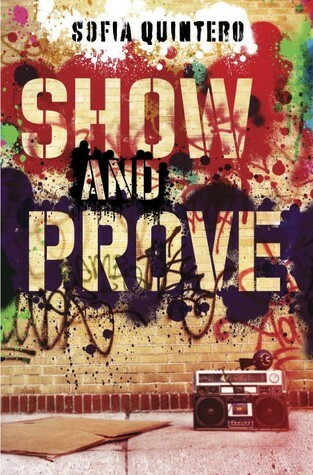 Show and Prove releases July 14, 2015. Click here to read our recent review of the novel. this post really spoke to me! So glad to discover this passionate woman!